I didn’t address the crypto situation much as it unfolded because I didn’t want readers mistakenly buying into the bubble. Now that the air has come out of the crypto-mania, I hope it’s safe to talk about the real opportunity. I’m not talking about Bitcoin. I’m talking about the blockchain – and the dividend growth opportunities that will unfold as this “megatrend” plays out in the coming years and decades. First, a quick primer on blockchain. The simplest way to describe the technology is to call it a digital ledger of sorts. It’s essentially just a group of encrypted records (“blocks”) that can be used to record transactions and other interactions. The utilization of blockchain that people are most familiar with are cryptocurrencies – products such as Bitcoin that are meant to serve as digital currencies, but have quickly become extremely speculative investments as they’ve gained thousands of percent in just a few years. But companies are increasingly learning that blockchain can be used for so much more, from tracing medical histories to keeping voting records. As a result, companies from Amazon (AMZN) and International Business Machines (IBM) to Bank of America (BAC) and Goldman Sachs (GS) are becoming increasingly involved in trying to exploit this technology. That has given rise to a few exchange-traded funds (ETFs) focused on this space, including one that’s surprisingly rife with dividend growth names. What fascinates me about this fund, however, is the dividend growth potential in some of its component stocks. Reality Shares’ BLCN is a deviation from its main focus: income. The ETF provider boasts another quartet of funds, all of which hold dividend stocks, and three of which are centered around the company’s proprietary “DIVCON” system. A stock like Visa (V) that yields just 0.6% hardly screams “income opportunity,” but it is. Visa has juiced its payout by 154% in five years. But it’s not just a prolific dividend grower – it’s a perfect example of the share-price growth you should expect when a company puts its shareholders first via increasingly generous cash payments. Visa already is elbow-deep in blockchain. The company launched a pilot phase of a blockchain-based B2B payments service called B2B Connect last year in partnership with banks in the U.S., South Korea, Singapore and the Philippines. The service will allow institutions to make payments to one another directly, and the second phase of the project is expected to go live later this year. Visa rival MasterCard (MA) also has its hands in blockchain, making its moves through the U.S. Patent and Trademark Office. In early April, the credit-card processing company filed a patent to help verify and store identity data on a blockchain system. Later in the month, it filed another patent, this time to create “fast track flags” within the blockchain that would allow nodes (any electronic device that performs a task within the blockchain network) to more quickly verify data, making the system work more efficiently. MasterCard might be an even more intriguing opportunity. While Visa’s share price and dividend growth have been roughly in line, MA shares – despite more than tripling over the past year – still haven’t caught up with the pace of the dividend, which has quadrupled and then some over the same time frame. Texas Instruments (TXN) isn’t exactly known for being the flashiest of chip stocks. Its analog chips and embedded processors, which make up 80%-plus of revenues, are found in some of the simplest of devices, from calculators to alarm clocks. But they have a wide array of uses, from appliances to displays to motors drives and even avionics. The company is increasingly delving into more cutting-edge technologies, however, such as the Internet of Things and artificial intelligence. And its position as a chipmaker also puts it square in the world of enabling the devices that make the blockchain possible. That said, TXN’s positioning in the less glamorous world of analog chips makes it a cash cow with the few companies that even want to compete with it. And Texas Instruments makes good use of that cash, more than doubling its dividend over the past five years. If the blockchain acts as a ledger of sorts, what better company to research its applications than Intuit (INTU) – the well-known purveyor of accounting software such as TurboTax and QuickBooks. Again, this is another prolific dividend grower that has more than doubled its quarterly dole in five years. And its DIVCON rating of 5 implies that INTU is well-armed enough to continue the upward march. One of BLCN’s most exciting holdings is also one of the “healthiest” from a dividend perspective. Nvidia (NVDA), maker of high-performance chips, is among the stocks most commonly connected with the booming blockchain technology. That’s because its GPUs are widely used by cryptocurrency “miners,” who need extremely powerful computers to do the processing necessary to generate new digital tokens. In fact, demand is so intense that Nvidia CEO Jen-Hsun Huang recently said the company needs to crank out more of the GPUs to catch up, as video gamers (Nvidia’s bread-and-butter market) are finding it difficult to procure the graphics chips their advanced games require. The sky seems the limit, then, for its blockchain potential, and the same goes for NVDA’s income opportunity. Because despite the fact Nvidia has powered up its dividend by 76% since 2014, it currently boasts a mere 11% payout ratio. 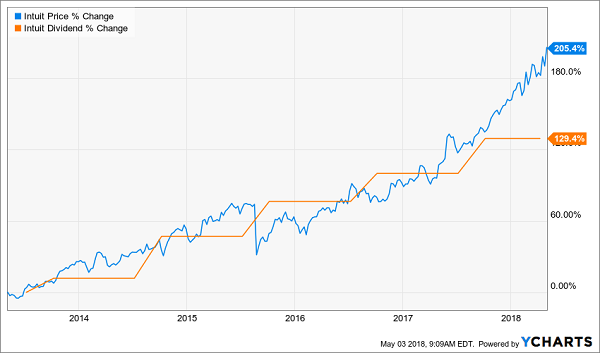 That’s a large reason why Nvidia boasts DIVCON’s top score of dividend health, and why investors should be licking their chops over this dual-threat stock going forward. How to Earn 12% Annual Returns For Life! Robust dividend growth separates the winners from the losers. And I’m not just talking about the stocks. Low dividend growth goes hand-in-hand with slow and no growth – and even eventual decay. Hitch your wagon to the supposedly “safe” blue chips that most financial pundits shill for, and you’ll quickly be looking for part-time work a few years into your retirement. If you want to retire fully funded and worry-free, it’ll take more – a lot more. In fact, it’ll take 12% in safe, annual returns. That sounds impossible, but it’s not. 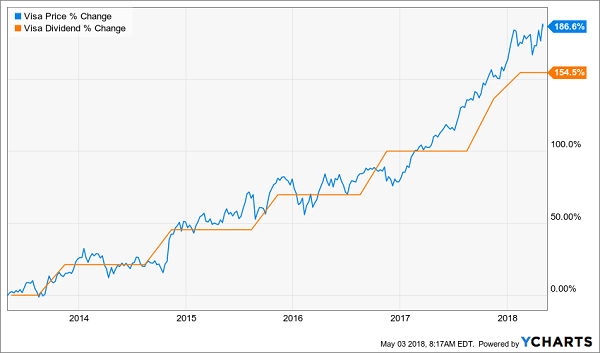 It takes a special kind of portfolio that offers high current yield, and dividend growth, and the potential for double-digit capital gains in some years. But after months of research and weeding out numerous “ticking yield bombs,” I’ve identified a handful of stocks and funds that check all those boxes. These stock picks will each reap at least 12% in annual returns – the magic number you need to meet to ensure the worry-free retirement you’ve labored so hard for decades to reach. 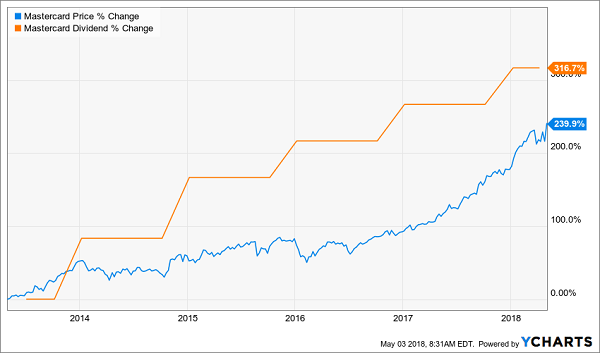 One stock that has juiced its dividend 800%-plus in just four years, and has at least another decade of double-digit growth ahead of it! A high-growth, high-yield “double threat” stock that threw off 252% gains the last time it was this cheap. A 9%-plus payer that hikes its payout multiple times a year, and is on track to double its payout by 2021! Income. Dividend growth. Capital gains. Even nest egg protection. This all-weather portfolio is a diversified powerhouse that provides three times more income than most retirement experts say you need, while being built to be more durable against retirement-shattering downturns like in 2007-09. I don’t want you to ever have to worry about how you’ll pay next month’s bills in retirement. With this portfolio, you won’t have to. In fact, you’ll be able to pay all your monthly expenses from dividend income alone, with enough left over for the convertible, the new master bedroom or the island vacation – all those extras you should be enjoying in retirement. Let me show you the way to double-digit returns that you can actually depend on. Click here and I’ll GIVE you three special reports that show you how to earn 12% for life. You’ll receive the names, tickers, buy prices and full analysis for seven stocks with wealth-building potential – completely FREE!